First Novels Club: Ten years later. I was fifteen, sitting in second period health class, when they told us over the PA system. Our teacher turned on the small TV mounted to the wall, and we watched the towers burning on the news. 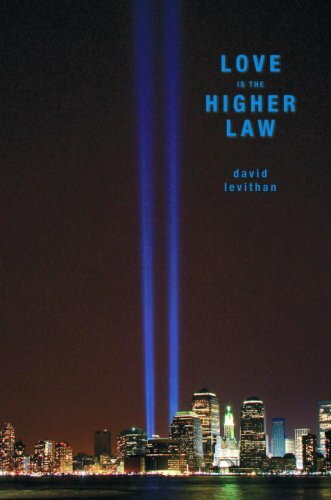 I've owned David Levithan's LOVE IS THE HIGHER LAW since November 2010, but I couldn't bring myself to read it until today. I was afraid of it, afraid to open myself up to the sadness and fear and incomprehensibility that fills me every time I allow myself to think --- really think --- about 9/11. I knew that it was about people coming together in New York on and after 9/11. About dealing with the aftermath. About uniting together and continuing to live, despite the tragedy. But for 10 months, I left that book sitting on my shelf. I read it this morning, all in one sitting, in less than two hours. It was exactly what I needed to read. Exactly how I needed to feel. It was my own quiet reflection time. Thank you, David, for writing it. And then I skimmed some of the other recent blog posts. Stephanie Perkins' post from yesterday led me to a beautiful one from Meg Cabot that broke my heart, gave me hope, and left me sobbing, quietly, at the computer. People are sharing their 9/11 stories on Rachelle Gardner's blog. Janet Reid reminds us to celebrate life. I didn't intend to write a post about 9/11. But ten years later, we're all still working through that day, and it's always better to work through difficult things together. It still is unbelievable to me that 10 years have past. This was a very nice thoughtful post & I am very curious about this book now. Your last paragraph says it exactly. Thank you.